There are two festivals in the Indian calendar which celebrate the beautiful bond between brother and sister. The first is Raksha Bandhan and the second, Bhai Dooj. While Raksha Bandhan is an affirmation of a brother’s protection of his sister, Bhai Dooj is an affirmation of a sister’s protection of her brother’s well being, and is primarily celebrated in the northern states of India. Bhai, of course, means brother, while ‘Dooj’ means ‘second’. The festival is so named because Bhai Dooj falls on the second day after Diwali, or the second day of the new moon. Every year the anticipation amongst sisters for Bhai Dooj is palpable. After all, it is a time when every whim of the sister is attended to and she is lavished with gifts and sweets! Though this day is celebrated in various ways in different parts of India, it essentially entails sisters applying a tilak of roli (vermilion), kesar (saffron) and rice on their brother’s forehead as a mark of their love and protection. They also pray for his prosperity, well being and good luck. In Uttar Pradesh, an aab is made by twisting flax into a circular shape. It is dotted with roli, and batashas (a kind of sweet) are placed in the centre. There are two aabs for each brother. The story of Bhai Dooj is narrated as the sister applies a tilak of roli and rice to her brother’s forehead. An aarti is then performed for the brother. In Bengal, this occasion is called Bhai fota. Sisters fast all morning till the ritual is completed. The tilak is made of ghee, sandalwood paste and kaajal. Diyas and incense sticks are an integral part of the ceremony. An aarti is also performed. The elder of the brother and sister gives the younger one rice and durba, a type of grass. Rice is a symbol of plenty and the evergreen durba is symbolic of longevity. Kheer and coconut laddoos are a must-eat. In Bihar, believe it or not, sisters start the occasion by heaping the choicest of curses on their brothers! Having done that, they prick their own tongues as punishment, with a thorny, wild fruit and ask for their brothers’ forgiveness for the curses, and also for past mistakes. They then bless them and pray for their welfare. The brothers swallow a few grains of bajri with water, before tasting yummy sweets from their sisters’ hands. Flowers and chocolates never go wrong on any occasion. 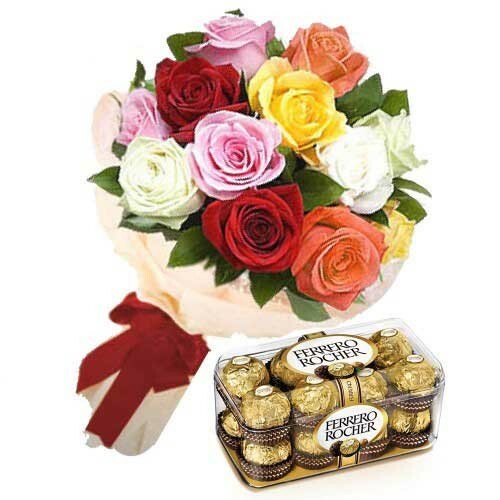 This combo consists of a bunch of mixed roses with a box of 16 pieces of Ferrero Rocher chocolates.